When ordering band saw blades, you must VERIFY that the length ordered will fit your band saw. ALL Blades made on demand for your order. You are responsible for ordering the correct size. Credit will not be given if the blade length ordered is not correct for your machine. 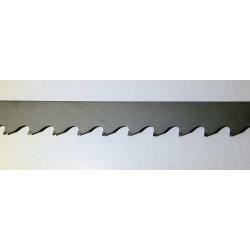 Check our Band Saw Blade Database for band saw blades with part numbers. Made from High Carbon Steel, the economical choice for general purpose and utility sawing operations. These blades cut a wide variety of materials from carbon steels and aluminum to abrasive materials like fiberglass and wood. Blade MaterialBi-metal Medium Tooth Cuts almost anything without changing blades! WOODMASTER blades are engineered for long life and consistent performance in a variety of wood cutting and Re-Saw applications. The blades are built to wear evenly and deliver straight cuts at extreme band speeds. These products cut faster and longer, which increases productivity and provides exceptional value.